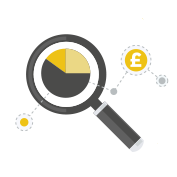 We understand that working with finances, your figures are going to be subject to scrutiny from your customers, and so your reporting and analytics need to be watertight. We also know that insights into your customer base are crucial to the ongoing and improved success of your business. That’s why we offer you in depth analytics on your transactions, allowing you to scope out everything from areas that need attention to identifying your best paying customers. We offer you analytics that allow you to review your accounts to identify opportunities for improved collection rates.